Did you know that there are tiny worms in blackberries? Once you know there could be worms in them, it’s enough to scare you into never wanting to eat blackberries again! Or at the very least cut open every one prior to eating to make sure they don’t have worms in them! If you find blackberries infested with tiny worms, then they are likely fruit flies, specifically the Spotted Wing Drosophila (or SWD). SWD can be found on/around fruit that is ripening on the plant. The little tiny worms that you see (that are often hidden in the middle of the berry) are the larvae of the SWD. As the larvae grow, the worms will be bigger. Because the worms are so small, it is often helpful to have a magnifying glass available when examining your berries, although this is not necessarily needed as the larvae (worms) can be seen if looking carefully with the naked eye. To many people, they will closely resemble very tiny white maggots and will not have a visible head. You will find the worms hidden in the middle of the berry or inside the flesh – they are unlikely to be sitting on the surface of the blackberry itself. Note: If you see a head on the little maggots, then you probably don’t have SWD larvae, but rather another type of fruit fly. So what are those blackberry worms and what do they look like? Although any fruit can be infected, some signs that they might be include fruit flies buzzing around your plant (almost a sure sign that there will be larvae in/on the berries). Another sign that many people say indicates a worm infestation is if you see damaged fruit flesh on the berry. One tip when growing blackberries it to pick them as soon as they are fully colored in order to minimize the potential appearance of the SWD larvae. 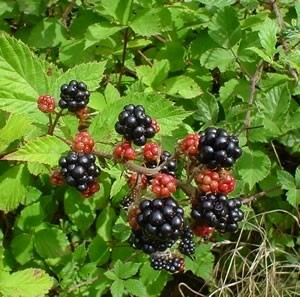 Organically grown blackberries – even those grown by local farmers – can be particularly susceptible to these worms / larvae, as they do not use harsh chemicals on their plants. Often farmers at your local farmer’s market will give you a warning if their berries could have the larvae. This does not however mean that all organic blackberries have worms as there are a few organic methods that can be used to prevent an infestation. An Ice Water Salt Bath! Fill a large bowl with water, then add ice and salt (1/4 cup salt to 4 cups of water), and the blackberries. Gently stir the blackberries to ensure water gets into each individual crevice, then allow to sit for 15 minutes. The salt should make the worms come out, and worms that come loose will start to float to the top of the water. In addition, keep an eye out for the blackberries that fall to the bottom of the bowl – those are likely contaminated with worms. Another trick that some organic berry growers say works is to freeze the berries. Apparently, during the freezinb process the larvae will wiggle their way to the surface of the blackberry – from there, you just brush them off. What happens if you eat the worms?